My Belgian D'Anver coop has once again become the Broody Coop. Literally half of the hens have turned to the desire for motherhood so I gave each a couple of eggs from the large fowl laying flock and the first two to hatch their collective five chicks are happy as bugs in a rug now. Thought you might enjoy some gratuitous chick pics on our blog today! These are Mina and Penny with their new charges. Caroline, my last hatchery hen, is now 7 years old this month in fact. It was the month of her hatch and it appears it may be the month of her death as well. Her crop has been progressively more pendulous and sluggish. We have provided multiple daily crop massages, but here are masses in there that seem to be hard as petrified wood, perhaps tumors and not food at all, masses we cannot break up. We try to push enough food through to make sure she gets nutrition daily, but she is losing weight. For two days now, she has ceased standing guard over arthritic Amanda, her usual job she took upon herself, and is standing alone, in an upright position, as if it's hard for her to breathe. Her eyes look tired and sunken. We adore Caroline, the queen of everything around here, the one who takes over any flock she is put into, the one who takes no guff off anyone, even bossy old Amanda. She's a tough old woman, but her time is near. She and her late sister, Miranda, made me love the Brahma breed. They're strong, lay nice large roundish eggs, take heat or cold equally well, have friendly, but not irritatingly clingy personalities, and they're just plain beautiful hens. Living on a farm can be work, fun and joy especially went the antics of silly animals abounds. However, there are those days that can make it heartbreaking as well. Yesterday was one of those days. 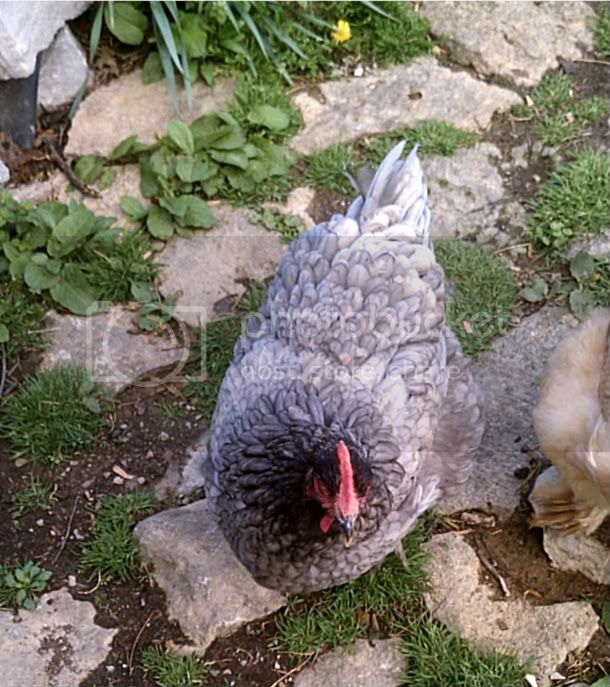 Here in Kentucky, we lost our beloved Blue Orpington hen, Athena. Athena was head hen around here and she was bold, beautiful and a darling girl. She was also the daughter of Suede and Smoky from Georgia, both of which have already gone to the great roost in the sky. The reason for discussing her passing is to bring to light an issue that our followers may not be aware of.....a condition known as Pendulous Crop as that is what stole our Athena from us and stole her mother from Cynthia. This condition usually occurs in the heavy breeds and can be passed from one bird to its offspring. It is not a contagious condition but will ultimately lead to the death of the bird. Pendulous Crop is when the muscles supporting the crop and of the crop, lose elasticity and are weakened, causing the crop to hang lower within the chest and swing or sway from side to side like a pendulum. The result is that the crop hangs too far down for the food to be continue to process and exit the crop. This ultimately lead to the crop not emptying, sour or compacted crops and eventual shutdown of the crop resulting in an inability to process food. This of course means starvation in essence. You can help slow this process by monitoring the type of food and the food intake, daily crop massages to help move the food through the crop but eventually the crop will shut down. The only good thing about losing our Athena, is that she went peacefully with her rooster, Lancelot, and I right there with her and she passed peacefully. Athena also took a very hard decision out of my hands. Cynthia and I have discussed many times over the last year on how and at what point I would put Athena down when the time came, as allowing her to slowly starve would be out of the question. We both knew it would come down to the question of when to make the decision. Athena passed away before ever reaching a point of my need to intervene. We were just starting daily crop massages and monitoring food intake and so forth and she went naturally. 1. pay attention to them and look for even the smallest change because it could mean something big is going on. 4. Always do what is right for the animal despite how difficult it may be for you personally. 6. Love your birds because the chances are very good that most or all of them love you too. RIP Athena, daughter of Suede and Smoky. You are already missed around here my big blue beauty. Today was a bit scarey around the Kentucky Farm as we had a very close near miss. Somehow one of the girls managed to knock down a supplemental heat lamp that was added to the silkies' area when our temps dropped into the single digits and nearly caused a coop fire. Typically, all the heat lamps are hung over the waterers to prevent freezing and they are secured with hand forged J Hooks and zip tied as well just in case. The addition of the extra heat lamp got forgotten in the rush of the holidays and the weather we have been having and it was not secured with zip ties or a J hook but merely on a standard hook and someone bumped it or attempted landing on it and down it came. It landed ontop of the extension cord used to power it, reflector and bulb down and it had enough time (less than 30 mins), to burn through the extension cord and to get the pine shavings smoldering. Thankfully, two astute free rangers that went back to the coop to lay, sounded the alarm which got not only my attention but that of the Roosters. So disaster was averted. So, I wanted to do a friendly reminder to make sure your heat lamps are secured, multiple ways to avoid a coop fire. That type of tragedy can be devastating on multiple levels. A doe, two of this year's fawns, seemed to be a doe and baby buck, perhaps twins, and a yearling, were in and around the house today and on the power line easement road beside the property. The doe wasn't very concerned by my presence on the deck with my camera aimed at her. Someone once said that if deer looked like warthogs, they wouldn't be overrunning the country today. They are beautiful animals, even if they do chomp down my azaleas and hydrageas.